This presentation talks to the importance of timing in our training. This is done under the umbrella of talking about bridges, ABC's and what's most relevant for the learner in front of us. There will be examples used with dogs, a goldfish and a cockatoo to help illustrate the points made in the presentation. The participants of the class will leave with a new way of looking at bridges and a heightened appreciation of the importance of good timing, not just when using a bridge but in all aspects of their animal training. Discuss placement of a Bridge in ABC's - With it being both a Consequence and an Antecedent. Talk about the importance of timing. Talk about the effects of delayed positive reinforcement on learning in dogs with literature based evidence. Talk about alternatives to clickers. Example of a flashlight used with a goldfish. The benefits of filming your training. Three steps for testing your clicker efficiency. A video case study with a cockatoo. Ryan is the founder of Animal Training Academy. For the past 12 years, he has been working as a professional animal trainer around the world, including in New Zealand, Australia, Canada and the US. 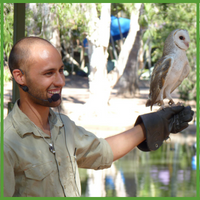 Ryan has trained teams, developed animal training programs, been published in leading industry magazines, spoken at international conferences and delivered presentations in a University on animal behavior. And through the Animal Training Academy, he has connect hundreds of animal behavior & training enthusiasts with a large (and growing) library of lessons and tutorials delivered by renowned animal experts.